Ireland, neutral during the Second World War, is often overlooked in histories of the conflict and of the 1940s. 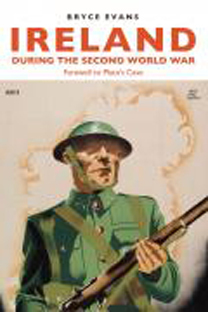 Dr Bryce Evans, outlines some of the details from his new book Ireland during the Second World War: Farewell to Platos Cave, and provides a short summary of the Irish experience of the war. New Book published by Manchester University Press (ISBN 978-0719089510) Independent Ireland, or Éire as it was then called, had achieved independence from Britain in 1921. Comprising 26 of Irelands 32 counties, the fledgling state eyed the descent towards war between 1938 and 1939 nervously. Its wartime experience would be one of hardship as it struggled to assert its neutral stance against Allied pressure to join the fight against Fascism. Between 1939 and 1945, Ireland was able to preserve its non-belligerent status. Perhaps the most controversial aspect of neutral Irelands war record was the decision of Irish premier, Éamon de Valera, to travel to the German legation in Dublin to convey his condolences on the death of Adolf Hitler in April 1945. This action was robustly criticised by British prime minister Winston Churchill, who despised his Irish counterpart and had once complained that negotiating with this wily politician was like trying to pick up mercury with a spoon. But de Valeras visit to the German legation was typical of a publicly scrupulous adherence to the neutral principle by the Irish government. The public face of fastidious neutrality masked a more complex reality. Irelands outward neutrality was counterbalanced by the states secretly pro-Allied stance during the war. British flying boats were granted covert permission to land on Irish lakes; Dublin fire brigades travelled north to assist in the aftermath of the Belfast Blitz; and Allied airmen who had crash-landed in Eire were quietly repatriated. Ireland also suffered bombing at the hands of the Luftwaffe during the war. Significantly, the government also executed members of the Irish Republican Army (IRA) who were intriguing with agents of Nazi Germany. Grafton St, Dublin, 1940s The decision of Ireland to stay neutral was informed by its very recent experience of conflict with Britain (1919-1921) and its Civil War (1922-1923). The Irish people, de Valera claimed in 1939, had no appetite for war. However this decision is still subject to heated debate in Ireland to this day, with the Irish Justice Minister recently referring to the policy as morally bankrupt. Recently, Irish servicemen who defected to fight for the British during the Second World War were granted an official pardon. On the other hand, Irelands wartime neutrality remains an influential part of Irish national identity for many. History, though, is not a morality tale and this very issue of morality  whether neutrality was right or wrong - has obscured the story of what life was really like  north and south of the Irish border  between 1939 and 1945. One famous historian has dismissed life in Ireland as akin to that in Platos Cave  the analogy implying stasis, ignorance and boredom. But the reality, as discussed below, was a lot more interesting. The Irish government may have been determined to uphold political neutrality, but it was unprepared for the economic realities of war. Its failure to establish a merchant navy in the 1930s meant that its imports (and therefore its economic survival) were heavily dependent on Britain. This was not a problem during the phoney war period, but with the Fall of France in June 1940 the British attitude to Irish neutrality darkened. Churchill, the new British prime minister, regarded Irish neutrality as selfish and resolved to subject the country to economic warfare, commencing a trade squeeze at the end of the year. This marked the resumption of the Anglo-Irish trade wars of the 1930s and Ireland was ill-equipped to deal with the centralised British economic power now confronting it. The result was that desperate Irish policy makers were forced to resort to begging, borrowing and stealing in order to keep the country afloat. Irish economic survival was often secured via hardline barter arrangements. For example, with the British and American garrisons in Northern Ireland swelling in preparation for D-Day from 1942 onwards, Guinness from Dublin was in high demand. Guinness supplies soon came to be used as a weapon of economic war by the Irish. The Black Stuff was withheld by the Irish government until the British and Americans supplied Ireland with much-needed supplies of animal feed, fertilisers, agricultural machinery and chemicals  supplies previously denied to Ireland by the Allies because she was neutral. But what was ordinary life like in this period? The economic depredations caused by Churchills supply squeeze were soon obvious in Ireland: a rise in unemployment, in prices, in crime, and a decline in public health. Irish Sea movements charted at Derby House, Liverpool2 Anyone who has read Flann OBriens The Third Policeman, which was written at this time, will be familiar with the primacy of bicycles in Ireland during the 1940s. This was a consequence of desperate fuel shortages which saw the country revert to horse and cart. Travelling south of the border remarked a Northern Ireland civil servant, was like travelling back in time 700 years. As in other countries, there was a marked expansion in the role of the state in Ireland during the war. A full rationing system was put in place relatively late  mid 1942  and was accompanied by a fastidious and fussy officialdom. As one Irish politician claimed, the state was on the verge of posting an inspector at every cross-roads, probably a committee inspecting him, and even an inspector inspecting the inspectors. By the introduction of rationing in Ireland in mid-1942, though, a booming black market was already in place. Irelands hungry people were desperate for goods newly unavailable due to wartime disruption. One of the most common gripes was about the lack of tea and tobacco. There were even reports in Dublin of Dublin zoos animals being stolen and consumed. Neither were the Catholic Church and the Irish State as close as is commonly assumed. The clergy reacted negatively to the loss of their material privileges as shortages took hold. Priests resented the loss of their cars under the Irish states ban on private motoring. One wrote to de Valera complaining that he needed his car because otherwise he had to travel on foot past sites where occasions of sin often occurred. He cited a recent hurling match where I had the misfortune to cross back through the yard of a local public house and was unlucky enough to come upon a travelling woman of tinker class, helplessly drunk, and publicly acting immorally with four young men. Smuggling also underwent something of a boom. 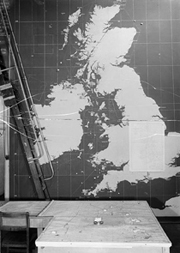 With different rationing schemes on each side of the border (Northern Ireland was, of course, part of the British war effort). Ordinary people smuggled goods back and forth to the frustration of police and customs officials. Many a skinny girl would travel south of the border only to return that evening heavily pregnant, and vice versa. The reason? The copious amount of consumer items concealed under their clothes and in their prams. Ireland also witnessed the ugly side of an economy on a war footing, an aspect of 1940s life so often ignored by political histories. Thousands of men endured hard labour on Irelands turf camps  desperately trying to produce fuel from the bogs. Many hundreds of thousands were tempted to emigrate, some never to return, to Britain and to the higher wages of the British war economy. Many carried out labour in Britain thought too dirty for any workers but the Irish. The Irish state also pursued an unpopular and coercive scheme of eviction of farmers considered unproductive as the tangible threat of starvation loomed. By 1945, George Bernard Shaw was able to remark that independent Ireland, a powerless little cabbage garden had managed to maintain its neutrality against the odds. But the price of neutrality would be Irish isolation from post-war financial recovery packages such as Marshall Aid and the persistence of poverty and emigration. In summary, Ireland during the war did not resemble Platos Cave despite its relative isolation from global conflict. Many Irish men and women contributed to the Allied war effort through military or labour service. For those that stayed at home, life was not all boredom. Rather, there was much of the fire of life in border pursuits between customs men and smugglers or in the tensions between the role of the state and the will of the individual. And if Irelands neutrality is to be subjected to moral judgement, it is worth remembering the important fact that, compared to the other European neutrals  Spain and Portugal, Sweden and Switzerland  Ireland was conspicuous by the absence of trade with Nazi Germany.